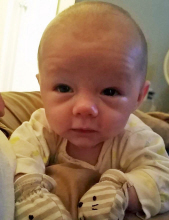 Adrian Ray Collins, infant son of Whitney York and Joshua Collins, passed away Thursday April 4, 2019 in Baytown, Texas. Services for Adrian will be 11:00 a.am., Friday April 12, 2019 at St. Joseph’s Catholic Church in Dayton with Father Ryzard Zawadzki, SVD, officiating. Interment will follow at Hardin Chapel Cemetery. Pallbearers will be Matthew Easley, Steven Collins, Johnathan Collins and Lorenzo Limon. Visitation will be Thursday April 11, 2019, from 6:00 p.m. – 8:00 p.m.
Adrian was born December 28, 2018 in Houston, Texas. He was preceded in death by his maternal grandparents, Kathryn Tullos York and Ernest York; paternal grandfather, Heath Collins; Great grandfathers, George Tullos and Edward “E.D.” Collins. Adrian is survived by his parents, Josh Collins and Whitney York; grandparents, Lorenzo Limon and Elia, and Christy Collins; great grandparents, Edna Tullos, Joyce Collins, Natavida Escobar and Angel, and Carolyn Collins; Uncles, Steven Collins, Johnathan Collins; aunt, Jessie Collins and Godfather, Matthew Easley. To send flowers or a remembrance gift to the family of Adrian Ray Collins, please visit our Tribute Store. "Email Address" would like to share the life celebration of Adrian Ray Collins. Click on the "link" to go to share a favorite memory or leave a condolence message for the family.